Suburbanization is the growth of areas on the fringes of cities. It is one of the many causes of the increase in urban sprawl. Many residents of metropolitan regions work within the central urban area, and choose to live in satellite communities called suburbs and commute to work via automobile or mass transit. Others have taken advantage of technological advances to work from their homes. These processes often occur in more economically developed countries, especially in the United States, which is believed to be the first country in which the majority of the population lives in the suburbs, rather than in the cities or in rural areas. Proponents of containing urban sprawl argue that sprawl leads to urban decay and a concentration of lower income residents in the inner city. Suburbanization can be linked to a number of different push and pull factors. Push factors include the congestion and population density of the cities, pollution caused by industry and high levels of traffic and a general perception of a lower quality of life in inner city areas. Pull factors include more open spaces and a perception of being closer to "nature", lower suburban house prices and property taxes in comparison to the city, and the increasing number of job opportunities in the suburban areas. Improvements in transportation infrastructure encourage suburbanization, as people become increasingly able to live in a suburb and commute into the nearby town or city to work. Developments in railways, bus routes and roads are the main improvements that make suburbanization more practical. The increase in the number and size of highways is a particularly significant part of this effect. Government policies can have a significant effect on the process. 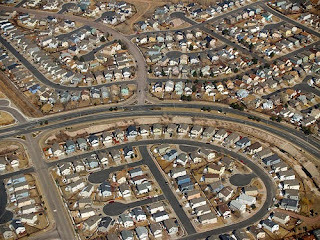 In the United States, for instance, policies of the Federal government in the post-World War II era, such as the building of an efficient network of roads, highways and superhighways, and the underwriting of mortgages for suburban one-family homes, had an enormous influence on the pace of suburbanization in that country. In effect, the government was encouraging the transfer of the middle-class population out of the inner cities and into the suburbs, sometimes with devastating effects on the viability of the city centers. However, some argue that the effect of Interstate Highway Systems on suburbanization is overstated. Researchers of this vein believe city center populations would have declined even in the absence of highway systems, contending that suburbanization is a long-standing and almost universal process. They primarily argue that as incomes rise, most people want the range and choice offered by automobiles. In addition, there is no significant evidence directly linking the development of highway systems to declining urban populations. Banks also fueled the push out of cities, as in many cases, they redlined inner-city neighborhoods, denying mortgage loans there, and instead offering low rates in the suburban areas. More recently, some urban areas have adopted "green belt" policies which limit growth in the fringe of a city, in order to encourage more growth in the urban core. It began to be realized that a certain amount of population density in the center city is conducive to creating a good, working urban environment. Race also played a role in American suburbanization. During World War I, the massive migration of African Americans from the South resulted in an even greater residential shift toward suburban areas. The cities became seen as dangerous, crime-infested areas, while the suburbs were seen as safe places to live and raise a family, leading to a social trend known in some parts of the world as white flight. This phenomenon runs counter to much of the rest of the world, where slums mostly exist outside the city, rather than within them. With the increasing population of the older, more established suburban areas, many of the problems which were once seen as purely urban ones have manifested themselves there as well. Some social scientists suggest that the historical processes of suburbanization and decentralization are instances of white privilege that have contributed to contemporary patterns of environmental racism. Recent developments in communication technology, such as the spread of broadband services, the growth of e-mail and the advent of practical home video conferencing, has enabled more people to work from home rather than commuting. Although this can occur either in the city or in the suburbs, the effect is generally decentralizing, which works against the largest advantage of the center city, which is easier access to information and supplies due to centralization. Similarly, the rise of efficient package express delivery systems, such as (in the United States) FedEx and UPS, which take advantage of computerization and the availability of an efficient air transportation system, also eliminates some of the advantages that were once to be had from having a business located in the city. Industrial, warehousing, and factory land uses have also moved to suburban areas. Cheap telecommunications removes the need for company headquarters to be within quick courier distance of the warehouses and ports. Urban areas suffer from traffic congestion, which creates costs in extra driver costs for the company which can be reduced if they were in a suburban area near a highway. As with residential, lower property taxes and low land prices encourage selling industrial land for profitable brownfield redevelopment. Suburban areas also offer more land to use as a buffer between industrial and residential and retail space to avoid NIMBY sentiments and gentrification pressure from the local community when residential and retail is adjacent to industrial space in an urban area. Suburban municipalities can offer tax breaks, specialized zoning, and regulatory incentives to attract industrial land users to their area, such as City of Industry, California. The overall effect of these developments is that businesses as well, and not just individuals, now see an advantage to locating in the suburbs, where the cost of buying land, renting space, and running their operations, is cheaper than in the city. This continuing dispersal from a single city center has led to other recent phenomena in American suburbs, the advent of edge cities and exurbs, arising out of clusters of office buildings built in suburban commercial centers around shopping malls and higher density developments. With more and more jobs for suburbanites being located in these areas rather than in the main city core that the suburbs grew out of, traffic patterns, which for decades centered on people commuting into the center city to work in the morning and then returning home in the evening, have become more complex, with the volume of intra-suburban traffic increasing tremendously. By 2000, half of the US population lived in suburban areas. During communism, most socialist countries in the Easter Bloc were characterized by under-urbanization, which meant that industrial growth occurred well in advance of urban growth and was sustained by rural-urban commuting. City growth, residential mobility, land and housing development were under tight political control. Consequently, sub-urbanization in post-communist Europe is not only a recent but also a particular phenomenon. The creation of housing and land markets and state withdrawal from housing provision have led to the development of privatized modes of housing production and consumption, with an increasing role for private actors and, particularly, for households. Yet, the regulatory and institutional frameworks indispensable to a market-driven housing system â" including housing finance â" have remained underdeveloped, particularly in south-eastern Europe. This environment has undoubtedly stimulated housing self-provision. Clearly, different forces have shaped different outcomes. Long-suppressed urbanization and a dramatic housing backlog resulted in extensive peri-urban growth in Tirana (Albania), which during the 1990s doubled the size of the city whereas war refugees put pressure on cities of former Yugoslavia. Elsewhere processes of suburbanization seemed dominant, but their pace differed according to housing shortages, available finance, preferences and the degree of âpermittedâ informality. The process was slow in Prague during the 1990s and more apparent after 2000, when housing affordability improved. Conversely, Slovenian and Romanian suburban developments visibly surrounded cities/towns during the 1990s. Nonetheless, socialist legacies of underdeveloped infrastructure and the affordability crisis of transition differentiate post-socialist suburbs from their Western counterparts. Various degrees of informality characterized suburban housing from illegal occupation of public land (Tirana), illegal construction on agricultural private land (Belgrade) to the unauthorized but later legalized developments in Romania. Suburban housing displayed a chaotic/unplanned character, especially in south-eastern Europe where the state retains a degree of illegitimacy. Excepting scattered for-profit housing, much of the new detached suburban houses seem self-developed. Allegedly, owner-building has become a household strategy to adapt to recession, high and volatile inflation, to cut construction costs and, finally, to bridge access to housing. The predominantly owner-built feature of most suburban housing, with the land often obtained at no cost through restitution policies or illegal occupation, allowed a mix of low-/middle-income households within these developments. Tijuana has experienced a strong wave of suburbanization from its urban core beginning in 2006. Historically, Tijuana city, with 1/4 the area covering 80 square miles, contained well over 95% of the total population of the municipality, and it was the poor relegated to living outside the city. Despite good highways, however, there was little incentive to move out of the city. However, with a huge escalation of the Mexico drug war violence, middle class city residents and property developers along with retail chains began building suburban communities and sold them as way to isolate themselves and their children from the negative effects. This led to a historic movement to communities outside the urban core, as evidenced by both the type of middle class housing developments and 2010 INEGI census figures. Historically it was believed that living in highly urban areas resulted in social isolation, social disorganization, and psychological problems, and that living in suburbs would be more conducive to overall happiness, due to lower population density, lower crime, and a more stable population. A study based on data from 1974, however, found this not to be the case, finding that people living in suburbs had neither greater satisfaction with their neighborhood nor greater satisfaction with the quality of their lives as compared to people living in urban areas. The economic impacts of suburbanization have become very evident since the trend began in the 1950s. Changes in infrastructure, industry, real estate development costs, fiscal policies, and diversity of cities have been easily apparent, as âmaking it to the suburbsâ, mainly in order to own a home and escape the chaos of urban centers, have become the goals of many American citizens. These impacts have many benefits as well as side effects and are becoming increasingly important in the planning and revitalization of modern cities. The days of industry dominating the urban cores of cities are gone. Companies are increasingly looking to build industrial parks in less populated areas, largely for more modern buildings and ample parking, as well as appease the popular of desire to work in more open and pleasant areas. Also contributing to the flight of industry from the city are government economic policies that provide incentives for companies to build new structures, as well as the lack of incentives to build on âbrownfieldâ land (previously used industrial land). As companies continue to build on pieces of land in less populated areas, it will become increasingly difficult to build in high-density areas. The main factor that causes this is that if any of the side effects of industry (noise, excessive lights, heavy traffic) affect residential areas, there is resistance from the homeowners. Another potential impact of industry leaving the city is that generally, when industry is separated from an urban area by some open space, as well as infrastructure, the open space between the city and the company becomes more intensely used. As this land becomes used more and more, the value of properties very often increases, causing many landowners in that open space to sell their land. Los Angeles suburbanization continues and America continues to sprawl, the cost of the required water lines, sewer lines, and roads could cost more than $21,000 per residential and non residential development unit, costing the American government $1.12 Trillion over the next twenty five years. Along with the costs of infrastructure, existing infrastructure suffers, as most of the governmentâs money that is dedicated to improving infrastructure goes to paying for the new necessities in areas further out from the urban core. As a result, the government will often forgo maintenance on previously built infrastructure. For residential properties, suburbanization allows for home prices to decrease, so people can drive until they can find an area in which they can afford to buy a home. However, these homes may lack certain things such as parks and access to public transit. Also, the prices of homes in downtown center usually decreases as well to compete with the inexpensive homes in the suburbs. One of the main benefits of living in the suburbs is that one gets a much larger piece of land than one would in the city. Therefore, as the size of lots increases, the supply of housing is more limited. The fiscal deficit grows as a result of suburbanization, mainly because in less densely populated areas, property taxes tend to be lower. Also, because of the typical spread pattern of suburban housing, the lack of variety of housing types, and the greater distance between homes, real estate development and public service costs increase, which in turn increase the deficit of upper levels of government. As the trend of suburbanization took hold, many of the people who left the city for the suburbs were white. As a result, there was a rise in black home ownership in central cities. As white households left for the suburbs, housing prices in transition neighborhoods fell, which often lowered the cost of home ownership for black households. This trend was stronger in older and denser cities, especially in the northeast and Midwest, because new construction was generally more difficult. As of the 2010 Census, minorities like African Americans, Asian Americans and Indo-Americans have become an increasing large factor in recent suburbanization. Many suburbs now have since 1990 large minority communities in suburban and commuter cities. Suburbanization is the growth of the neighborhoods and areas that surround the main city center. In the United States, suburbanization has been rooted in racial tensions. Therefore, now white privilege can explain how city centers full of crime, poor health conditions, and underperforming school systems consist mostly of African Americans while wealthy suburbs consist mostly of Caucasians. In order to understand suburbanization, one should understand what white privilege is. Racism is not always a hostile, discriminatory act. It can sometimes be rather a systemic and structural form of discrimination that is known as white privilege. White privilege can be described as âan invisible package of unearned assets whichâ one âcan count on cashing in every day but about whichâ, one âwas âmeantâ to remain oblivious. White privilege is like an invisible weightless knapsack of special provisions, assurances, tools, maps, guides, codebooks, passports, visas, clothes, compass, emergency gear, and blank checks.â This quote shows the type of assets that could be comparable to the âinvisible assetsâ of white privilege. One of these assets is being more likely to be born in a suburb with above average living conditions and better opportunities. In the 21st century, white privilege is not always a clear and conspicuous issue, but it is still evident because of the historical conditions that have caused many whites to still have some superior living situations today. In the US, Suburbanization in the mid to late 1900s was the movement of the privileged upper class, almost all white, to larger plots, lower crime rates, and better health conditions. It left minorities with more crowded and polluted environments, poorer health conditions, and fewer opportunities. Throughout the 1900s, whites had definite privilege due to racism and legislation that still favored the segregation of blacks. Blacks were not granted the same opportunities as whites because after Plessy v. Ferguson in 1896, the âseparate but equalâ doctrine did not actually provide blacks with similar facilities and resources as whites. Therefore, even though that privilege is not currently evident, it is rooted in racial conflicts that have built the platform for white privilege in the present. Similarly, many suburbanites may not recognize concrete evidence for white privilege when it comes to suburbanization. The only evidence is the obvious divide in the majority of US cities with minorities in the metropolitan core and whites in the suburbs. Even though white flight was largely caused by the influx of Southern blacks, many other factors also contributed to suburbanization. The area covering both the city and the suburbs can be referred to as the Metropolitan Statistical Area (MSA), which has been expanding rapidly since the 1970s. Therefore, it would be reasonable to assume that suburbanization was most extreme during the postwar era. However, suburbanization has been occurring for a longer time period due to many factors such as crime, interstate highways, railroads, and racial tensions. White privilege did allow the whites to mostly take over the suburbs, but those with higher incomes found it easier to relocate. In general, âwhile a greater proportion of the population is living in urban areas broadly defined, a smaller proportion is living and working in central cities.â This quote summarizes the point that suburbanization would happen regardless of any situation because of advances in technology and overcrowding in cities. It illustrates that the population as a whole is growing and is dispersing throughout the metro area instead of clustering together in the city. It is easy to see why that is a more efficient way to live, but white privilege explains how the population divides itself into cities and suburbs. However, suburbanization in the United States has historically been a more complicated process than poor minorities situating the city while rich whites dwell in suburbs. Before white flight, suburbs were considered âslums, home the marginalized denizens of society.â Many poor âragpickers, junkmen, prostitutes, and squattersâ lived in these outskirts of the city. Slaves would situate themselves in the suburbs in accordance to the âliving out systemâ which allowed slaves to avoid living in the alleyways behind their ownersâ houses. However, in the late 19th century, white flight began partially due to the industrialization of cities, making them less habitable and living conditions poorer. People with the means to afford property in the suburbs fled from the cities, and the vast majority of these people were white. Recently, African Americans have moved in larger numbers to suburbs. From the 1950s to 1970s, the percentage of blacks living in cities rose from 42% to 58%. As the general population spread more into suburbs, blacks followed and relocated to suburbs in increasing numbers throughout the 1970s. However, African Americans statistically faced segregation in suburbia more than Hispanics and Asians. The 1980 census revealed that 44% of Hispanics compared to 29% of metropolitan blacks (up from 16% in 1970) lived in suburbs. Even though African Americans started moving away from urban centers to suburbs in the mid-1970s, the African American suburbs were usually older, scanty, and detached from other suburbs. They also spent a disproportionate amount of their revenue on social services, thereby mimicking inner city conditions. Other suburbs have often managed to remain ethnically homogenous by using tactics such as high rents, restrictive zoning, or even collective action to prevent outsiders from moving in. An interesting comparison in the condition of suburbs can be made between the United States and the rest of the world. The general trend for the United States in the late 20th Century was that cities contained the working poor while the suburbs housed the wealthy. Around the world, the cities were typically wealthy while workers and immigrants were forced to live in public housing in the outskirts. For example, in Brazil, favelas, urban shantytowns, are located on the Northern and Southern peripheries of Rio de Janeiro. In France, Banlieue, a suburb with three-quarters of its population in subsidized housing and 36% below the national poverty line, is located outside Paris. A reason for the difference could be the difference in the establishment of the cities at the time of immigration. For example, in the United States, Harlem was a failed project for upper-middle class white housing. Therefore, blacks migrating from the South managed to populate Harlem since pricing was relatively low. In contrast, the current favela developed in the outskirts because of a program called âParque Proletarioâ that aimed to keep the poor out of the city center. Therefore, Americaâs unique experience with racism factored into the suburbanization process. In general, even though suburbanization was an inevitable occurrence with a growing population, the way people dispersed themselves was affected by race. Suburbanization relates to white privilege because whites were the ones who originally inhabited the suburbs and were the ones with the opportunity to either welcome or repel minorities from migrating. For minorities, there were barriers for moving to suburbs because âSuburban succession and segregation are generated through a variety of individual and institutional mechanisms including redlining, restrictive zoning, organized resistance to black entry, and racial steering.â This quote describes various causes of racial segregation. Many of them are indirect ways to prevent assimilation of whites and blacks, which were implemented in the later 1900s. 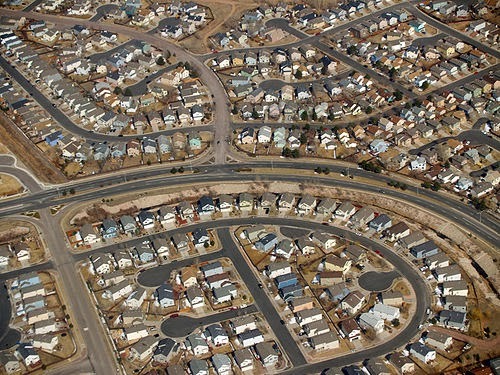 Therefore, Suburbanization in the United States occurred in a unique way because of the countryâs history of segregation. Burchell, Downs, McCann, Mukherji. (2005) "Sprawl Costs: Economic Impacts of Unchecked Development" London, Island Press. Fishman, Robert. (1987) Bourgeois Utopias: The Rise and Fall of Suburbia New York: Basic Books. Garreau, Joel. (1992) Edge City: Life on the New Frontier New York: Anchor Books. Hayden, Delores. (2004) Building Suburbia: Green Fields and Urban Growth, 1820-2000 New York, Vintage. Wiese, Andrew. (2005) Places of Their Own: African American Suburbanization in the Twentieth Century Chicago, University of Chicago Press. Soule, David. (2006) "Urban Sprawl: A Comprehensive Reference Guide" London, Greenwood Press.